IMAK Smart Glove with Thumb Support from HealthyKin.com helps prevent and relieve wrist pain associated with CTS, arthritis and tendinitis by encouraging proper, ergonomic hand and wrist position, with added stability and support for your thumb. I have a problem with Tendonitis at the base of my thumb, so I appreciate the thumb splint and the back of hand splint. I don't need the weight of the cushion protecting the underside of the wrist. It was too heavy for me, so I put a hole on the inside of the cushion containing sack and pushed the little beads out. I would also appreciate about a 1 inch shorter wrist cover, so that my wrist watch is covered. For that I just folded the wrist end of the glove back. Now, I wear it all day, and it's great! I could give this a 5 star, but it's sold as one and people usually have 2 hands. I do like the fit and the added beads give good support. Not so restricted when I'm typing. I have cerebral palsy, great protection for my hand. 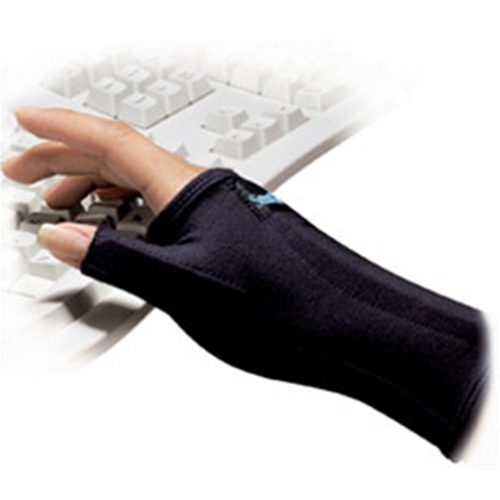 THOUGHT THE WAY IT WAS DESIGNED THAT IT WOULD HELP MY SORE/SPRAINED THUMB, BUT IT HASN'T. AFTER WEARING IT FOR AN HOUR OR MORE ACTUALLY HAVE MORE HAND PAIN. Works great! Could be sewn better on the Thumb, but otherwise no problems.